Sometimes rules supplements read like the world-setting bible of frustrated novelists. Although solid world-building is a useful skill, you don’t always need four paragraphs of flavor text to tell you swords are cool, magic is power, shadows are scary, and orcs are savage. Sometimes a GM doesn’t have time to slog through a page of history for every magic weapon. Sometimes all that’s needed are a few cool ideas, with just enough information to use them in a game. Sometimes, all you need are bullet points. 1 With A Bullet Point is a line of very short, cheap PDFs, and each one gives the bare bones of a set of related options. It might be five spells, six feats, eight magic weapon special abilities, or any other short set of related rules we can cram into about a page. Short and simple, these PDFs are for GMs and players who know how to integrate new ideas into their campaigns without any hand holding—they just need fresh ideas and the rules to support them. No in-character fiction setting the game world. No charts and tables. No sidebars of explanations and optional rules. Just one sentence of explanation for the High Concept of the PDF, then bullet points. 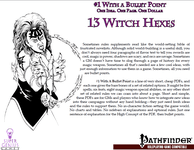 The High Concept: 13 new hexes to give witches a broader range of options.